As the old adage goes – and as every PR in their right mind knows – you should never work with children or animals. 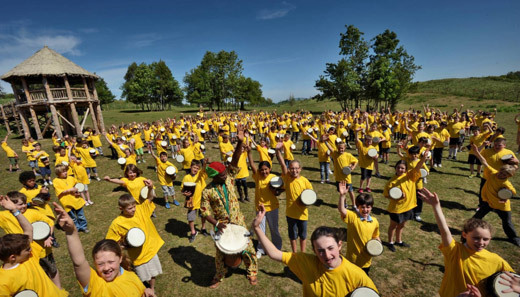 So when, as part of a campaign to launch Chessington World of Adventures’ Africa-inspired restaurant, Zafari, we came up with a stunt which would see 260 schoolchildren congregate to break a record on site at Chessington Zoo, you would be forgiven for thinking we had completely lost the plot. But rewind a brainstorm or three and you’ll find there was indeed a grain of method in our madness. Record breaking – as the phrase implies – is no easy feat. Yet when the very first Guinness Book of Records was published back in 1954, I would be very surprised if its authors had ever imagined the influence they would subsequently have over the world of PR. For whether it’s the world’s largest massage (another certificate on the wall at Clarion, this time broken for Nectar), the world’s most expensive bottle of white wine (as if Chateau d’Yquem needed the extra publicity – it was £75,000 for the 1811 vintage, if you’re interested), or the fastest 100m hurdles run while wearing swimming fins (congrats Christopher Irmscher, your mum must be so proud), there’s virtually no limit to the number of records that can be broken, no matter how obscure. And for anyone who saw the world’s largest gathering of Smurfs in Metro, or the world’s biggest naked rollercoaster ride in the Daily Mail, you’ll know that the media loves a good superlative just as much as the rest of us. And if the record attempt fails? Even then it may still get in. Yes, we’re talking about you, Katie Price. The more popular the world record has become as a tactic for getting branded coverage on news pages, the more difficult it has become to guarantee it’ll be your extraordinary feat making the morning papers. So no matter how long your sausage dog, or how bearded your lady, if the photo doesn’t show a sense of scale and ultimately impress the pants off the picturedesks, it’s not going in. A world record attempt can be newsworthy in itself – and whilst Guinness may thank you very much indeed for the free coverage, your client may not be quite so impressed when their branding is cut by the subs. Ensure your brand plays an integral part in both the story and the shot itself, and don’t forget to caption your pics. You’ve drafted the press release, booked the photographer, called in the Guinness adjudicators, pre-sold in your story and fine-tuned the logistics of the Big Day. So spare a thought for the poor PRs who set up this record-breaker and forgot to come up with a Plan B, only for it to rain, no-one turn up, and it be branded a ‘catastrophic failure’ by everyone’s favourite red-top, The Sun. Oh and by the way, working with children and animals really isn’t all that bad. But working with 260 children playing 260 drums simultaneously? Now that’s what I call a challenge. Will Sundays Ever Be The Same Again?